Microdermabrasion is a quick, safe, effective form of exfoliation for ALL skin types & colors with NO downtime, NO PAIN or discomfort. It has been available in Europe since the late 1980’s. 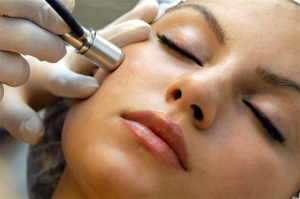 It uses a diamond-tipped applicator with a slight suction to remove dead or damaged skin cells. Skin will appear softer, smoother, brighter, clearer, fresher and younger looking.